Osborne had a smaller offensive line against many of its top opponents, including Pike Valley in the regular season, West Elk in the second round of the playoffs, and St. Francis in Saturday’s Eight-Man, Division I state championship game. Still, the Bulldogs’ line play, especially in the fourth quarter, along with their ability to score and stop two-point conversions, helped Osborne finish 13-0 and capture its second state title in four years. The Bulldogs defeated top-ranked St. Francis, 38-24, at Newton’s Fischer Field. Osborne trailed 24-22 entering the fourth quarter but senior running back Cullen Grabast rushed for two scores. Osborne converted both two-point plays. The Bulldogs finished with 764 points and broke its own state mark of 760 points set in its other undefeated state title season in ’13. In their previous two postseason contests, Osborne outscored West Elk 20-0 in the fourth quarter and Burlingame 14-0 in the fourth quarter. Overall, the Bulldogs were never outscored in the fourth quarter this season and had a total margin of 70-12 in the game’s final 12 minutes. In Week 4, Osborne delivered a key 34-32 home win versus Pike Valley and outscored the Panthers, 8-6, in the fourth quarter. In the Pike Valley victory, Osborne limited the Panthers to 1 of 5 on 2-point conversions. In the state game, St. Francis finished 0 of 4 on two-point conversions. The Bulldogs were 4 of 5 on two-point plays at state. Entering the contest, the Indians had converted 57 percent of two-point conversions. Osborne converted 62 percent of two-point conversions this year. “They were huge, and in big games in eight-man football, they are everything, and our kids, we talk about it, our kids executed on our two-point conversions and conversely on defense, we did an excellent job defending theirs,” Riner said. Senior guard/linebacker Derek Naegele (225 pounds) is Osborne’s lone player who weighs more than 200 pounds. St. Francis featured starting senior guard Jerry Neitzel (6-4, 240), junior center/nose guard Trayton Doyle (6-3, 230) and junior linebacker Dalton Straub (6-2, 200), along with three others at 190 pounds. Sophomore defensive back Kade Miller paced the Bulldogs with 13 tackles, plus a key pass breakup and interception, while Naegele had 12 stops. Osborne’s defense permitted 37.6 points per game last year and lowered to 17.7 this season. It delivered a nine-win improvement from 4-5 in 2015. Senior 190-pound lineman Landon Lackey played well on both sides at guard/defensive end and collected a sack, while junior 195-pounder Roxton Brown battled Doyle at center. Osborne ran 50 times for 295 yards versus an Indian defense that had permitted just 74 points before state. Late in the third quarter, standout freshman Darrien Holloway went out with a concussion. With 10:06 left in the game, Grabast scored on a 19-yard run to give Osborne the lead. Grabast finished with 196 rushing yards, while junior Denton Schurr tallied 87. Overall, the Bulldogs tallied 8.89 yards per play, better than the ’13 season of 7.97 yards per play. Osborne had 86 percent of its offense come on the ground en route to 343 rushing yards a game. The ’13 season, which set a state mark for individual and team completion percentage with quarterback Jake Tiernan, had 76 percent of its yards come on the ground. Riner, credited throughout the town and eight-man football for helping make Osborne a state power, deflected all the credit to his players. When the Bulldogs first lined up for the team photos on Fischer Field, Riner and the coaching staff stood off to the side. Family and friends asked Riner and the staff to join. However, Riner kept saying, “It’s about them, it’s about them” and wouldn’t join. Hanover senior quarterback Will Bruna set single season marks last season for eight-man passing yards (3,452) and touchdowns (56). Coupled with an excellent senior season, Bruna shattered the eight-man passing mark for career completion percentage, a record Dighton senior quarterback Tyler Lingg also broke. Both players surpassed the mark of Kensington’s Kirby Rust, who completed 60.7 percent of his passes from 1986-89. Hanover defeated Dighton for the Division II game, 68-22. Bruna, a two-year starter, finished his career 311 of 423 for 5,169 yards for 73.5 percent completion. He had 87 career touchdowns versus just seven interceptions. Bruna fought through a rib injury that he suffered in the sub-state win against Pike Valley. “Just like having another coach on the field,” Hanover coach Matt Heuer said. “When he went down, myself included last week, I had a little bit of breath go out of me, but at the same time … I knew that he was going to play, and if he wasn’t going to play, he was going to give everything in his heart to try to be out here. “Just having him out there, the mental toughness, the physical toughness, and just the headiness that he brings to the table is just incredible, and it’s been a real blessing for me to be able to coach him,” he added. Lingg, a four-year starter, was 381 for 611 for 5,321 yards with 79 touchdowns against 24 interceptions for a 62.4 percent rate. 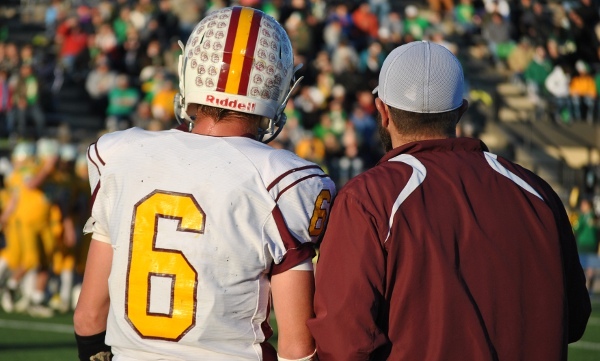 He helped Dighton win a playoff game in 2013 and advance to its first state championship this season. Before 2016, Dighton was 3-8 all-time in the playoffs and went 3-1 in the postseason this fall.